Confession: I had never done Build-a-Bear before yesterday. This is apparently shocking to some people, including my friend Courtney who texted me one day demanding that we go sometime this summer. She just wanted to go because she thought it would be fun. She didn’t realize that she’d be joining me for my first ever actual Build-a-Bear experience. I’ve been in Build-a-Bear twice before. I had no idea there was one closer than the Ross Park Mall, which is quite the trek, but a very cool mall. I went in with my in-laws last year on an impromptu trip to the mall for Christmas type shopping and again to fill out our Christmas in Pittsburgh day since the giant Macy’s is now gone. We went into the Build-a-Bear there, but we didn’t buy anything, or make anything. We just kind of browsed all the things they had. One of the things being a night fury. Yes, Toothless the dragon was available and I didn’t get him right then and there. I was unaware that the bears they stock tend to rotate in and out fairly often and he probably wouldn’t be there the next time I went in. 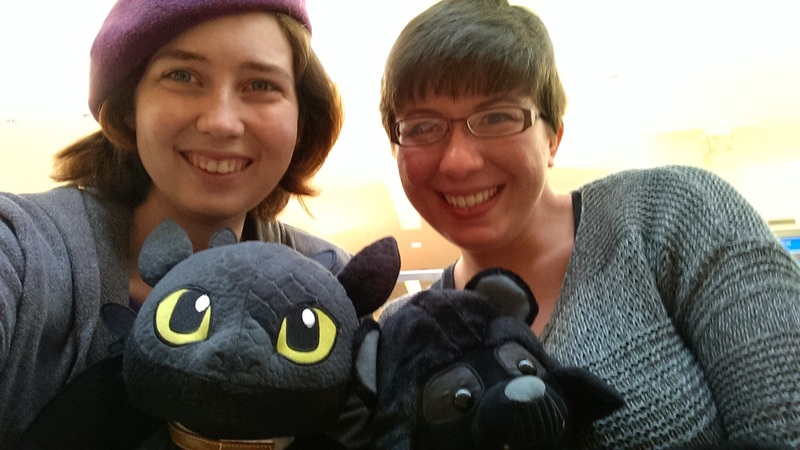 We moved on from Build-a-Bear that day, but I did rather want to make a night fury of my own. Thus, when Courtney texted me that Build-a-Bear should be a thing, I was totally on board. She was much more insistent that we plan a date soon when she found out that I’d never built a bear before. So yesterday I picked her up in the morning, we ran down to the Mall at Robinson, which is also a rather nice mall, and we wondered around until we located the Build-a-Bear workshop. And I was so excited. There is some regret over the fact that neither of us thought to capture the experience on video. The night furies were still there and I grabbed mine instantly. It was a little funny, Courtney browsed through the Star Wars bears, trying to decide while the employees there explained that if we got two in the same collection the second was only ten dollars, so if I wanted another dragon it’d only be ten dollars more than I was already spending. What did I need another dragon for, though? All I really wanted was a night fury. Courtney settled on a Darth Vader bear with the Imperial March sound for his paw, and we were ready to put them together. The employee brought me over to the stuffing section and was also in shock when we told her I’d never done Build-a-Bear before. “We’ll have to give you the full experience then!” she proclaimed as she wrote my name on the tag. 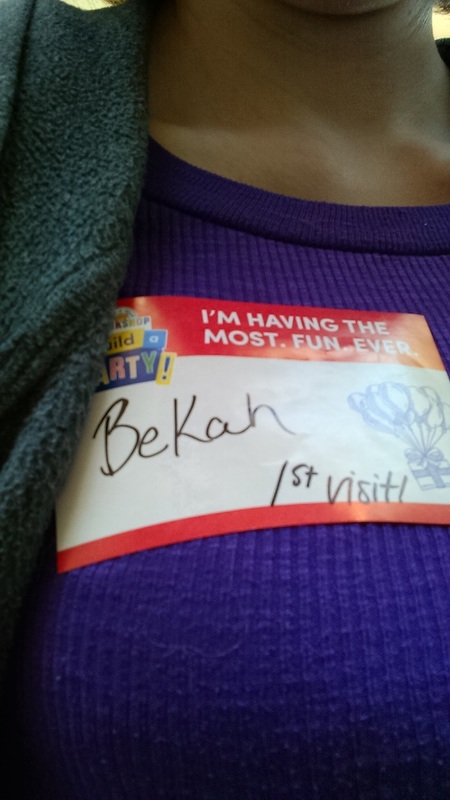 She pulled out a name tag and wrote my name out again with “1st visit” written underneath, which I wore proudly for the rest of the day. She had me pick out a heart and warm it between my hands. I then had to jump up and down so that he would have lots of energy, spin once in a circle so he’d never get lost and back the other way so if he did get lost he could find his way back. Then I kissed the heart, made a wish and kissed it again to seal it in and put it into my night fury. I did all of this with a giant smile on my face, so excited to finally get the experience I’d never gotten as a child. Once our bears were filled and stitched and ready to go I was told a bath was in order. 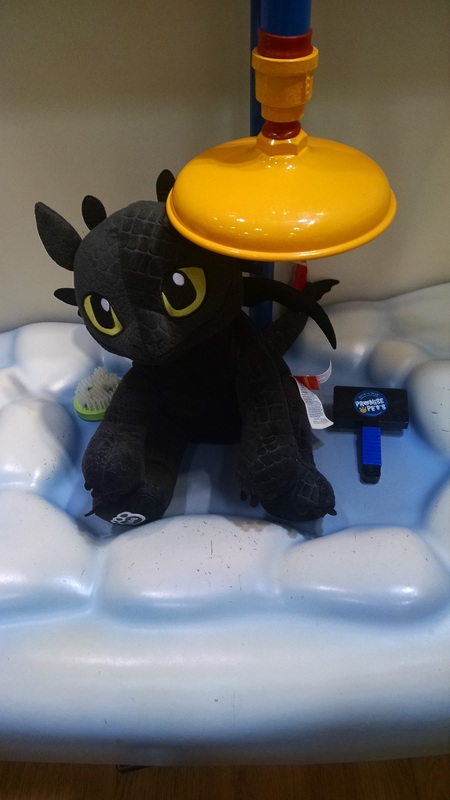 They have an adorable air bath for the bears and I happily gave my night fury a quick wash and a brush before we went to find outfits and accessories for them. Courtney’s Darth Vader bear was already dressed properly so she only considered a lightsaber for him. Unfortunately they only had Kylo Ren’s lightsaber and that just wouldn’t do for Darth Vader Bear. For me I got a saddle for Toothless, of course and tried to put it on upside down before the other lady working that day corrected me. Now that my dragon was all dressed we went to fill out their birth certificates. I named my night fury Toothless, of course, because what else do you name a night fury? Our birth certificates were printed and we chatted with our employee as she rung us up. I was given a house box to carry Toothless in, because it’s part of the whole experience apparently. Courtney opted for just a bag for her bear. And that was our day at Build-a-Bear. I have to admit, it was a lot of fun. I can’t say that I regret not doing it as a kid, though, because I enjoyed it just as much as an adult, I’m sure. The kid in me says I should totally do it again, but the adult part of me is saying we had our fun and we have a night fury and that’s enough, I think. I am so pleased with my Toothless!